The shoulder vise is a chain-drive twin-screw vise, with 18-3/16" spacing between the screws, 8-1/8" of travel, and a 29-13/16" maple jaw. The rugged tail vise has 7" of travel and a non-traditional “no L-block” jaw. The front stretcher is 4-1/8" wide and flush to the front of the legs and benchtop. Trestle legs are 4" square and flush with the front of the bench. 8 feet long (including tail vise handle) x 2 feet wide (excluding the shoulder vise). 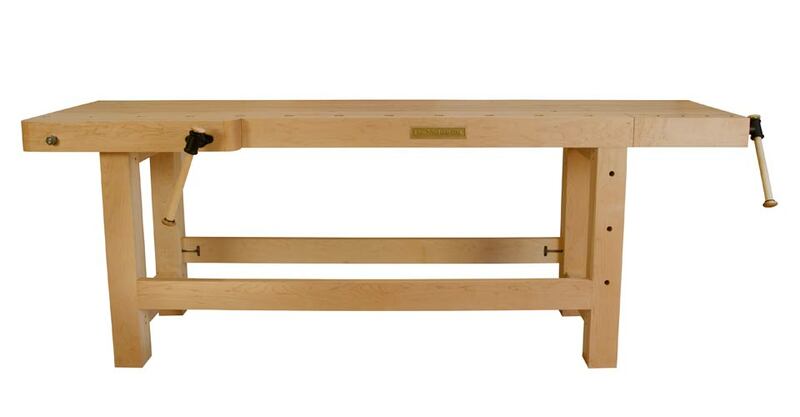 Our benches come equipped with two rugged vises: our Chain-Drive Shoulder Vise, with 8" of travel, and our non-traditional, “no L-block” Tail Vise, with 7" of travel.